Monday Meditation: The Eagle and the Jackdaw. I previously posted this on another blog iteration. I find it's still appropriate today. An Eagle, flying down from his perch on a lofty rock, seized upon a lamb and carried him aloft in his talons. 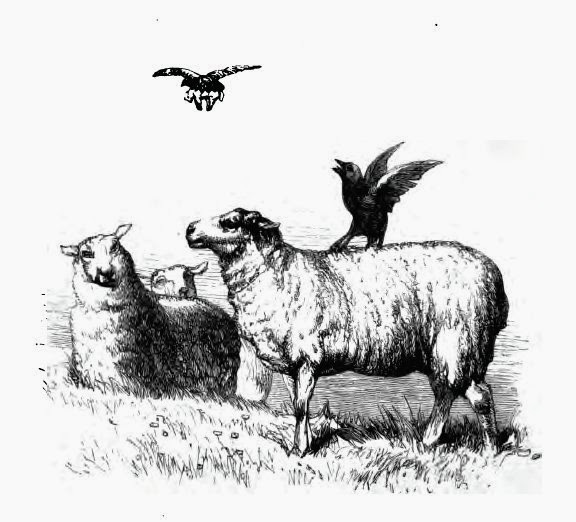 A Jackdaw, who witnessed the capture of the lamb, was stirred with envy and determined to emulate the strength and flight of the Eagle. He flew around with a great whir of his wings and settled upon a large ram, with the intention of carrying him off, but his claws became entangled in the ram's fleece and he was not able to release himself, although he fluttered with his feathers as much as he could. 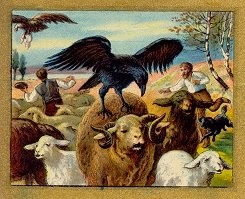 The shepherd, seeing what had happened, ran up and caught him. He at once clipped the Jackdaw's wings, and taking him home at night, gave him to his children. On their saying, "Father, what kind of bird is it?' he replied, "To my certain knowledge he is a Daw; but he would like you to think an Eagle." Eagles and Jackdaws both have a purpose in the world, but they have very little in common, other than both being birds. Eagles are large birds of prey that are considered to be apex predators in the world. Jackdaws are small members of the corvid family that feed mostly on invertebrates. In Aesop's story, the eagle was serving his purpose and intention. The jackdaw, however, found himself in all kinds of trouble by not fulfilling his own. First, the jackdaw paid too much attention to the eagle. By wasting his own precious time and energy focused on the eagle's activities, he became jealous and wanted to compete with the eagle. He wanted to take that eagle down a notch- prove that this eagle wasn't "all that." With this kind of intention, the jackdaw immediately set himself on a course of self-destruction. He quickly discovered that he could not beat the eagle by trying to "BE" the eagle. He ended up entangled in a mess, and, to add insult to injury, the eagle wasn't even paying attention to him. The eagle was already long gone. In the end, the jackdaw lost his freedom both to fly and to live as intended; and he suffered the humiliation of having his true intentions exposed and ridiculed by those around him. How much would you be willing to bet that he blames the eagle for his misfortune, as well? Had the jackdaw simply focused on his own purpose; had he been content with his unique gifts and talents, how much happier would he have been? If you are an eagle being hounded by a jackdaw, I highly encourage you to ignore those antics. Focus on your goals, and continue to fulfill your purpose. Soar above it all, and keep being you. If you've found yourself relating to the jackdaw, take heed of his cautionary tale. Don't look at someone else's life and envy it. You have no idea what their own challenges entail. One thing is for certain- they are naturally equipped to deal with those. They also don't have the natural ability to handle your challenges like you do. The eagle's beak is hooked. It cannot pick up sticks and use them as tools, but a jackdaw can. The eagle misses its prey more often than a jackdaw misses his. In petty attempts to "take down" someone else by trying to be better at being them than they are, one only thwarts him/herself. Eventually, that kind of thinking and behavior will take its toll, and it only ends badly for the jackdaw. Most likely, this person wasn't even paying attention to you. Rather than waste time, energy and self-esteem on futile attempts to be someone you are not, focus instead on the wonderful gifts that you can share with the world. Take to the skies in your unique flight pattern and fulfill the purpose that only you can. As the adage says, "Be yourself. Everyone else is taken." Our diversity is what makes life special. The eagle is only better in the eyes of the jealous jackdaw.